I´m experiencing what I am going to call traveler´s block. I am being faced with sensory overload and my brain has decided it´s siesta time. 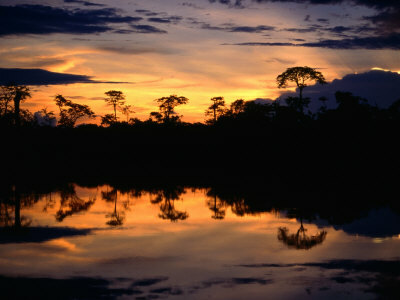 I have less than a week to make a decision regarding a trip into the Amazon jungle and I can´t focus. Details from this jungle lodge or that tour agency are getting scrambled with words like ¨primary rain forest¨ ¨pink river dolphins¨ (what are THOSE?) and ¨kidnap.¨ Then you throw some dollar signs into the mix and my head really starts to spin. Things were going great until last week. I had scribbled and arranged my tentative travel plans onto a makeshift calendar, carefully allotting a 4-5 day time frame to experience the ¨real¨ jungle. And then I heard about the kidnappings. Two female tourists, one from Britain and one from Australia were taken from the very reserve I had planned to visit. Well crap. Tonight I heard of another person who recently escaped from this same area in Sucumbios near the Colombian border after being held for 21 days (he finally just made a run for it). So that makes three in the last month. What´s a girl to do? I did a little research and the U.S. State Department sites 11 Americans sequestered in the last 11 years from this region. Hmm. So…one a year? Hundreds, probably thousands of tourists visit this area every year, and for a reason. Secluded jungle lodges, wildlife, indigenous culture, and the chance to feel as if you´ve gone back in time. Who wouldn´t want to experience these things? As I sit here looking at my cards, not knowing what move to make I´m tempted to go all in. Perhaps it´s the lure of the dark jungle or the need to feel brave that causes me to up the anty. Certainly if you gave me the choice between being kidnapped by Colombian guerrillas and going into the virgin rain forest I wouldn´t choose the guerrillas. But what if you´re only facing the odds, staring at the unlikely chance that it could be you? We make gambles all the time when we travel. Like high rollers we place our faith in Lady Luck hoping that we won´t get sick, lost, or conned. We gamble on our ability to navigate in a foreign city, to remember the words for ¨where¨ and ¨thank you.¨ We even take chances on bigger things like leaving behind jobs and relationships. So what level of danger or risk is navigable? Where do we draw the line? As travelers do we become addicted to the thrill of the game? Does the inticement of the unknown laced with the savory taste of danger turn us into adrenaline seeking junkies chasing the next high? Like a penitent amateur that may be in over her head, I am seeking your sage advice. The cards are these: I can stay in a world renowned isolated jungle lodge in a safer part of Ecuador and pay out my nalgas for it- close to $1,000 for a three night stay. I could go with an average travel agency and stay in an area of rainforest that has been civilized (ie secondary growth), see fewer animals and pay a decent amount of money. Or I could go with an agency I´ve already had a great experience with and trust, venture into the Cuyabeno reserve crossing my fingers (and not telling my mum) and pay only $50 per day to see the real deal. Should I play the safer hand or put on my best poker face and hope the cards that are dealt will be in my favor? What would you do?